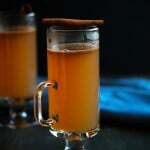 Hot buttered rum with apple cider made with homemade apple cider mixed with rum and a spiced compound butter. Add all the spices and sugar to the soft butter and mix well. Put the butter mixture on a piece of cling wrap and mold it into a log shape. Wrap it tightly and place in the fridge or freezer to harden a little bit. Pour the rum and butter batter into a mug and fill with hot apple cider. Stir and serve! To make this cocktail in a crock pot, once you are done brewing your apple cider, measure some out and put it in a slow cooker. Put in about 1/2 tsp of the butter batter and 1 to 2 oz rum for every cup of cider.